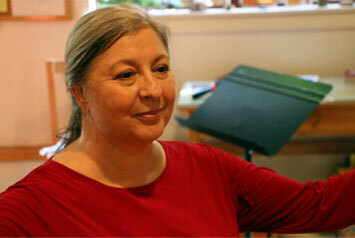 Pamela Blanc has established herself with distinction as a prominent teacher of the Alexander Technique with over thirty-nine years of experience teaching the Technique and is the Senior Teacher of Jessica Wolf’s Art of Breathing. Whether you come to The Alexander Technique to enhance your performance skills, to reduce stress, tensions, backaches & pain or to improve posture & your general well-being, you can benefit from having lessons. The Alexander Technique is a unique system of physical and mental re-education teaching you to identify your habitual patterns that could be contributing to the level of stress you experience in daily life, habits of movement and habits of thought. These words are as true today as they were all those years ago. Your kinesthetic sense can be re-educated to be more reliable and your breathing to be more efficient. The Alexander Technique is a study in the “Use of your Self”; a simple and practical method for changing habitual patterns of muscular tension, improving breathing and one’s over all well-being. How you use your self does affect how you function. If you are malfunctioning, consider changing your manner of use. The Alexander Technique is designed to give you the tools to change. To learn more click Alexander Technique. Copyright © 2019. Pamela Blanc. All rights reserved. | Site by Momentum Creative Studios.